Being quality-centric firm, we are engaged in presenting a high-class range of Bobcat Solid Tyre Without Rim. We assure our clientele the prompt delivery of these products at reasonable prices. 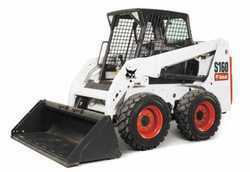 We are offering our clients a wide range of Skid Steer Loaders or Bobcat Skid Steer Loaders both for purchase and for Rent. These Skid Steer Loaders are known for their high performance. We Marwell Enncon Tech Pvt Ltd , An Authorized dealer for Doosan Bobcat India Pvt Ltd ( Formerly known as Doosan Infracore India P Ltd ) for Tamil Nadu & Kerala region. 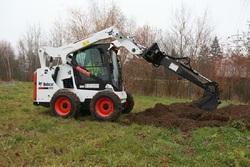 Banking on our enriched industry experience, we are able to supply Bobcat Doosan Skid Steer Loaders. Our reputed entity is engaged in supplying Bobcat Skid Steer Loader. Steering and Drive- Forward, Reverse, Travel Speed and Steering Controlled by two hand levers. Transmission Hydraustaic, Four Wheel Drive Hydraulics- Raise/Lower Lift arms and Dump/ Rollback Bucket controlled by two foot pedals or Optional Hand Controls Auxiliary Hydraulic Hand Lever. Very lowest affordable rental charges for a minimum hire period of as low as from 3 days on-wards. It can go into work minimum 5'6" wide site on-wards, and a height of 6' on-wards. It works on highly compact areas. Marwell Enncon Tech Pvt Ltd.
Form a versatile team with your Bobcat Skid-Steer Loader and dozens of attachment options. You'll find a Bobcat attachment for nearly any job. In fact, we offer more attachments than any other manufacturer.